I started taking pictures for others in 2008, but have always enjoyed taking pictures. I now have a studio in my home, based in Riverton, UT but also provide on-location services. I specialize in family and child photography, but always enjoy trying something new! Feel free to take a look at my work and book your session today! I have a lousy memory so I highly value preserving memories and special moments in a photo! I am a mother to four boys and have an amazing husband who is so supportive of my love of photography. I love that I can work my photography around my family life and love using my love of photography to preserve the memories of our family. I look forward to making beautiful pictures of your family! Studio sessions are in my home studio located in Riverton and can include up to 4 people. Maternity sessions can be individual or include the entire family. Pregnancy goes by so quickly, while it may at times be hard to imagine it ending you will treasure the photos of this precious time in your life! Newborn sessions can be done in studio or in your home. Newborn photos should ideally be taken in the first 10 days of your baby's life. 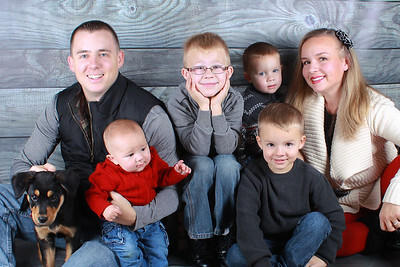 All family sessions include individual portraits of each child, as well as different groupings of the whole family, just kids, parents, mom and kids, etc. My style for family pictures is a mix of loosely posed and candid. I prefer family sessions be on-location so we can run around and play with the kids, however I also enjoy working with kids in my studio. I charge hourly for event photography $200/hour, this fee includes full coverage of the event including posed photos, candid photos, detail shots, and an online proofing gallery of all the edited images.